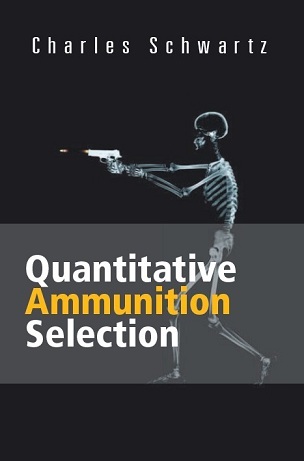 QUANTITATIVE AMMUNITION SELECTION presents an accessible mathematical model that allows armed professionals and lawfully-armed citizens to use water as a valid tissue simulant to evaluate the terminal ballistic performance of self-defense ammunition. Using a projectile's average recovered diameter, weight, and impact velocity to predict its penetration depth and the mass of permanently damaged tissue within the permanent wound cavity, the quantitative model produces a tangible measure of any projectile's terminal performance, permitting an accurate and direct comparison of all types of self-defense ammunition. The model produces results equivalent to those obtained in tests employing calibrated ten percent ordnance gelatin as a tissue simulant without the associated technical and logistic difficulties. With a little familiarization, the model's equations can generate accurate results in less than three minutes using only a hand-held scientific calculator. Chapter 1 explains the need for an understandable terminal ballistic performance model and the constraints required to produce a valid quantitative model. Chapter 2 addresses the principles of mechanics, fluid dynamics, and thermodynamics underlying the quantitative model and establishes the dynamic equivalence of water and calibrated ordnance gelatin as ballistic test mediums. Chapter 3 provides the model's derivation and clearly presents the model's equations, variables, and its operational constraints. Chapter 4 contains several detailed computational examples that demonstrate all aspects of the model's application. Chapter 5 explains the model's application to the terminal ballistic performance of projectiles of exotic composition and unconventional manufacture in calibrated ordnance gelatin and soft tissue. Chapter 6 describes the procedure for constructing an inexpensive, durable test fixture and the correct procedure for conducting terminal ballistic tests using water as a test medium. Chapter 7 dispels in plain language several long-standing terminal ballistic performance myths and misconceptions using the laws of physics. Chapter 8 discusses the effects of clothing and mild steel intermediate barriers upon the terminal ballistic performance of service-caliber handgun projectiles using a quantitative approach. Chapter 9﻿ describes a simple, highly correlated expedient equation that produces accurate predictive yields supplementary to the primary quantitative model. Chapter 10 addresses the relevance of environmental conditions and terminal ballistic performance factors to liability mitigation and provides a set of ammunition selection criteria suitable for most contingencies. Copyright © 2012 - 2019 by Charles Schwartz.